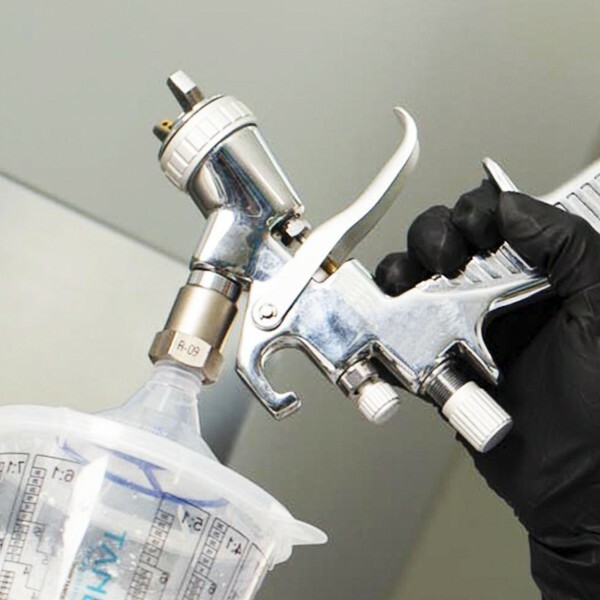 Easily mount the Paint Application System on your spray gun. The Tander Paint Application System helps you to prepare in no time, as you're ready to start your paint job after two short actions. The Tander Paint Application System Adapter helps you to easily mount the system on your spray gun. Make sure the thread of your spray gun is clean. Simply screw on the adapter and secure by using a bahco or wrench 22. Secure the adapter tightly with a bahco or wrench 22. This prevents leakage! Adapters are available for all common types of spray guns. If you can’t find the right adapter, consult your local Tander dealer or contact sales@tander.com. Is the adapter easy to mount? Yes, you simply twist it on your spray gun and you are ready to connect your paint application system. Make sure you use a bahco or wrench 22 to secure the adapter and prevent leakage. How long can I use this adapter? The Adapter is made of brass with a nickel plating to guarantee durability. The adapter can be used for multiple years without any problems, apart from the normal usage wear. How do I find the right adapter? We have adapters available for most types of spray guns. IF you are in doubt about which version to use, please contact us at: info@tander.com or give us a call at: T +31 (0)88 182 6337. We will kindly assist you in picking the correct adapter.